RT-AC3200 is a tri-band 802.11ac router featuring Tri-Band Smart Connect, an incredible new feature that automatically maximizes the performance of your wireless devices. With the world's fastest combined data rate of 3200Mbps (2600Mbps on the two 5 GHz bands plus 600Mbps on the 2.4GHz band), RT-AC3200 allows every device to work at full speed, ensuring lag-free online gaming, silky-smooth 4K UHD video streams, and effortless downloading. Add to this superb coverage and advanced security, and you'll see why RT-AC3200 takes your network to the next level. Fixed out of memory issue when using guest network. Fixed Chrome, Edge and IE compatibility issues. Fixed quick internet setting wizard compatibility issues. Fixed NAT issue caused by UPnP media server. Fixed dual wan issues in PPPoE or PPTP or L2TP + DHCP environment. Updated NAT Acceleration setting help message. Enabled smart sync under AP/Media Bridge. Supported new 3G/LTE USB dongle Docomo L-03D. 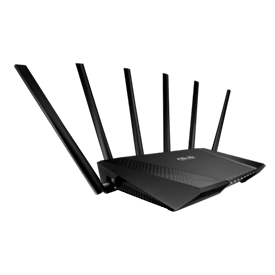 Ultra-fast 802.11ac Wi-Fi router with a combined tri-band data rate of 3200Mbit/s for smooth up to 4K/UHD video playback, ultra-fast file-sharing for large files and low-latency online gaming.